Everyone and their mother (and grandmothers) is talking about oil prices. It has become THE central topic related to the financial markets. Two years ago, Wall Street gurus were calling for $120 oil, seeing almost nothing that could hurt oil prices. Today, these same people are calling for oil to drop to $20 (I have seen as low as $10), with no end in sight and no prospects for higher prices. This behavior is very typical of market and human behavior. Anyhow, there are a couple of topics below related to oil, so I thought I would start with a long-term chart of oil prices, including the inflation adjusted price, which is not shown in most charts. 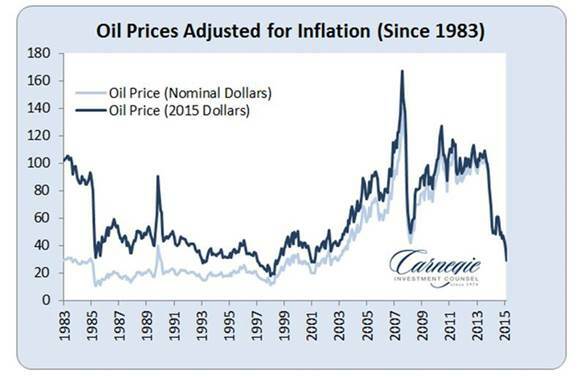 As you can see, real oil prices are as low as they have been in at least 32 years. One of the biggest questions facing stock market investors going forward is whether the recent weakness is a healthy correction like 2011, or the beginning of a bear market, like 2001 or 2008. Obviously no one knows the answer to this, but below are a couple of charts that look back at data during previous recessions and bear markets. In the first chart (below) provided by Strategas, the blue line shows wage rate growth over time. As you can see, wage inflation of 4+% preceded every recession since 1980. Currently, wage inflation is a mere 1.9%. 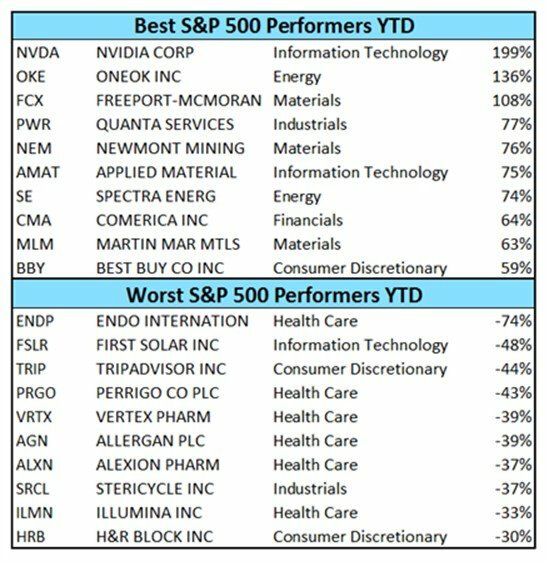 The chart below shows the S&P 500 in white and Consumer Confidence in green. As you can see, these two series are usually highly correlated, with consumer confidence dropping before a recession and in unison or before the stock market. In today’s case, while we have experienced a fairly sharp stock market decline, consumer confidence has remained strong and even increased in the face of market weakness. Market Top or Market Consolidation? As you surely are aware, oil and the associated energy stocks have dropped precipitously over the past year. Although the dynamics and inputs have been different each time, it is interesting to consider the recent decline relative to past periods of extreme weakness. Looking at similar periods over the past thirty years, the magnitude of the recent drop is “in the neighborhood” of the other declines. You will notice, however, that from a duration standpoint, all of the other declines lasted longer from peak to trough, suggesting that the current rout may not be over and could hit new lows in the coming months. On June 30th, there will be a leap second. Scientists need to do this every so often to syncronize atomic clocks with the slowing rotation of the earth. Some clocks will read 11:59:59 twice, others will read 11:59:60 and others still will smear the leap, as they call it. This seems simple enough, but last time this happened, Mozilla, Reddit, LinkedIn and other sites all reported crashes. In Australia, 400 flights were grounded due to a Qantas Airlines software crash. As far as the markets go, this will be the first time in the electronic age that this will have been done during the week. It is happening at night time here, but apparently we are closing our afterhours trading early. In Asia, most systems are smearing the leap second by slightly adjusting each second in the day leading up to the event. A second doesn’t seem like much, but there are now computer trading systems that can react in as little as one-millionth of a second.